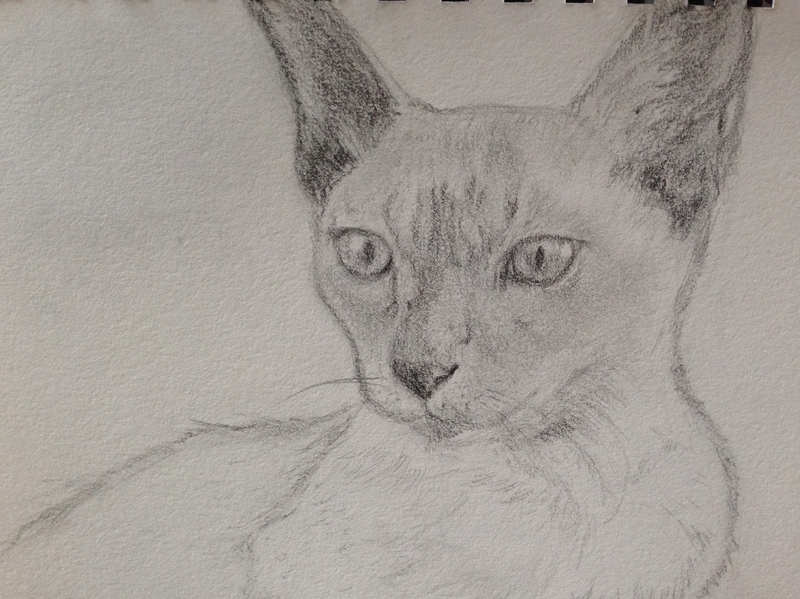 Starting the year off with a challenging 3/4 view of a friend’s Tonkinese boy kitty, Toru. He’s a youngster with beautiful markings. It was much tougher than I thought it’d be to get his proportions right, and I wound up taking help from a ruler to get the features placed. It took about 2.5 hours just to get this sketch down (because I first tried without the ruler and did lots of erasing, lol). This was done with a standard 2B graphite pencil in my Strathmore mixed media journal. I’m finding animals challenging, but cats in particular. Dogs seem to be easier, and not sure why, as I’ve owned cats most of my life. I love the soulful eyes of a dog. I could probably draw eyes of all kinds forever and never tire of it, and dog eyes are probably my favorite. EDIT: Speaking of drawing animals, I can suggest a book that helped me out a lot. It’s called “The Artist’s Guide to Drawing Animals: How to Draw Cats, Dogs, and other Favorite Pets” by J. C. Amberlyn. I’ve read other books by this author too, and she’s really a terrific artist and teacher. She devotes a chapter to each animal and breaks them down feature by feature, which I really found helpful. Here is an Amazon link to it, and my library had the book as well, so that may be an option too! I’d love to eventually paint Toru in watercolor. His fur contains lovely shades of brown and his eyes are the most beautiful crystal blue you’ve ever seen. He’s a doll! Actually, not sure how I’d mix the blue in his eyes! Wishing everyone a peaceful, happy and healthy 2016! Thanks for all of your visits and support! < My creative goal for 2016: 100 faces! Good luck with your challenge – Toru is gorgeous! Thanks so much, Ana! 😀 I really appreciate your visit & comment! Happy New Year! Toru is beautiful Laura! You can tell he is a youngster, and you have so captured his curiosity and character in his eyes. Yippee Yay for #1 of 2016! I am so excited I could burst to watch the drawings and numbers grow! Happy New Year Laura! Hugs! Thanks so much, Jodi! We’ll see where the path winds and wanders, huh?? 😀 Happy New Year! Thanks, Sharon! I was amazed at just how challenging this pose was. You are off to a great start. Nice sketch. Watercolor would be something to explore. So much fun! Thanks, Carmel! Watercolor would be even more of a challenge, I think. Particularly the eyes, which I wouldn’t even know how to mix. Something to think about for the future. Thanks for your encouragement! I’ve got a few cat photos that would be good candidates for this….very nice start to your series. Yay, Nexi! Are they on your blog? If so could you post a link? Or feel free to send photos to createarteveryday@comcast(dot)net. I’d love to see them. The closer shot of the head, the better, (but I should practice cat figures as well). Black cats are very tough for me right now but I’m willing to try most anything else. Did a search – results on mine. Thanks, Kathy! Right back atcha, just love your posts always! I’m glad you enjoyed this one. Do you have any pets you’d like me to take a shot at? Awesome! I soooo hope they’re not black. I’m having trouble with black cats and dogs at this point. I do hope to progress past that, though! I’d love to see your photos. 💛💛💛 Getting a good photo to work from is at least half the battle, for me, at least. Haha…two black retriever mixes and one black cat! Oh, you’re a funny one, Kathy! Lol thanks for the vote of confidence! Hey Kathy, do you have any photos of any of their faces in lighting that would allow me to see both eyes clearly? I’d really like to work on black animals so I could improve them. The photo is key, though, as their features are so hard to see. If anyone would have a good photo, it’s you! Lol, sounds great! I think you’re wise to have a focus. It’s taken me this long to realize that I want to focus on faces!! I still haven’t narrowed it down to what type of face (and don’t even get me started on mediums)! great way to start the year! I really like how delicate the lines are and how you captured the feline ‘attitude’. Thanks, Arvind! I’m glad you enjoyed it! Love this!! Very well done Laura. I find cats more challenging too, though I’ve only ever tried one. 😊hehe So excited to see your faces and I hope you’ll doodlewash this!! 😉💜🎨Happy New Year! Glad to hear you also think cats are challenging. I seem to have an easier time with photos of Penny, but I’ve drawn her so many times. Why are dogs easier with their longer hair?! I don’t get it but they are. Noses though. Dog noses are very tough, IMO. Wow, nice recipe! Thanks! I still struggle with perspective. Cat noses have it too but I agree with you; I think dogs have more. (And having owned cats, I’ve spent lots more time studying them.) You are really good at perspective; I still remember how great your buildings were! It’s much harder for me to draw a book on a table in front of me than it is to draw a face. It is just so far beyond me lol. I found a really great book about it but it just doesn’t call me now. Maybe I could take a class in it? OOh, I’ll have to take a look. Thanks so much, Charlie!!! You are such a wonderful encouraging friend and helper to us all! Thanks, Judy; I appreciate that! Wow, that is quite a challenge you’ve set for yourself, I’ll have to check it out! I tend to shy away from the selfies. I’d much rather draw someone else. I’ve tried my hands, feet, eye and lips but wouldn’t think about trying to put them together at this point lol. Good for you for taking that challenge on! Are you gonna stay with it for next year, or try something different? Hi Laura, thank you so much for dropping in. I am not sure yet about continuing with the selfies. There are two online classes I am toying with the thought of taking…but which one…hmmm. I seldom watch any evening TV, as I am painting on my iPad. But I need to haul out paints, pens, etc. and get messy! Even a little watercolor paint box and small journal could still be an in front of the tv type thing and not too messy. Would be nice! You’re welcome, Jill, and I know the feeling! I think you’ll really love the book. I have another post somewhere with a bunch of animal noses in it and it came straight from that book. I just started drawing her sketches. I find it really helps me to do that. Thanks for your sweet encouragement. I’d love to write a book someday but I’m not sure I’d ever be good enough to write an art one. It would be so cool though and I bet you could! You’ve tried just about everything and have tons of knowledge to share. I think the thing that’s helped my drawing the most is drawing daily, which I started sometime around June last year and the polychromos pencils. I think pairing them with a slightly toothy paper and using a very light touch, focusing not on line but on shade, those are the tips I would offer, for what they’re worth. The author you mentioned has also written books on drawing animals, and I believe artist network tv has her videos as well (which I believe are also available for purchase from north light books and probably Amazon too). There are so many good artists out there, and so many techniques to try. Thanks again for the encouragement, Jill! Yay!!! That’s basically what your journal suggestion led me to. Woot! So many things to reach toward! Thanks so much, Susan! I really appreciate it! Laura, he looks like a siamese cat. Good work. Thanks so much, Julie! Yes, he’s half Siamese and half Burmese! I really appreciate your feedback! This is a lovely drawing. Maybe cats’ faces are harder for you, because you know them so well and are more aware of any inaccuracies. Do you own any cats at the moment? My girl just passed in September and my boy cat the May of ’14. 😦 I have tons of photos of both of them but finding black cats and dogs very tough! I think this one was harder because he’s young. His ears are huge, way larger than I thought they’d be, considering the size of his face. Glad you like it, Zoya! I appreciate your encouragement! Oh 😦 Will you get more cats? I used to love sketching cats as a kid. I haven’t sketched many animals lately and really should try to find some willing subjects. I think you did really well in your sketch, because he does look like a young cat. Funny how drawing makes us pay attention to various details that we totally miss otherwise. We’ve not ruled it out, but it’ll be awhile, I think. Glad you enjoyed the drawing! I do think we see things we missed before, for sure. Having cats didn’t make the job of sketching them much easier for me – unless I could get them sleeping. I do have lots of photos though. Prancer, our boy cat, was all black, and I’m still working on rendering black animals. Very tough unless the photo is really great! I can imagine how hard it would be to paint a black cat. Makes me think of the Japanese brush paintings – such simplification and boldness of lines. Laura – post ‘top cat’ up; not quite as suitable as I’d hoped, but it’s made a nice post. Think I’d deliberately aim for a close up photo from scratch for something like this, but if any are any use, you’re welcome! Thanks, I’ll take a look, Nexi! Thanks, Nicola! He was such a beautiful subject, and I have great photos, which is a huge help. I’d love to do a painting of his eye alone. If I could really capture it, it’d be amazing. Siamese eyes…nothing like them! Thanks, Rebecca! They all sound beautiful! Looking forward to seeing your paintings. You capture furry animals so well! Very nice start to a new series, Laura! Thanks, I’m really excited about it and curious to see where this takes me. Eyes have called me strongly from the start! I could almost do a whole series just on them lol. Happy 2016, Laura! Looking forward to the portraits! Happy New Year, thanks for stopping by, M.R.! Wonderful sketch, I love the eyes, awesome! Thanks, Donna! This one was so challenging. I think young people and young animals are tougher than adults. Glad you enjoyed it! Nice cat as alway ! Best wishes to you and yours for 2016 ! Thank you, Agnes! That means a lot, coming from you! I hope 2016 will be good to you! Thanks for stopping by! Thanks so much, Ann! I’m really glad you’re enjoying my challenge. The break helped me to see that faces should be my focus! Ann, I am loving faces so much that I wonder if I’ll ever stop! Did a human tonight and looking forward to more of those as well. I could just bounce between animals and people forever and be soo happy!